White Denim...gasp! I know! But when Carrie said lets show the world that you can wear white denim after Labor day (Anytime Sept through April...cuz go ask your granny thats when you are supposed to retire white shoes and pants and all that jazz). You know I am competitive and will take on any challenge...I tried to drink a gallon of milk in college...a group of boys dared me...I didn't make it. So when she threw it out there I said W.T.Heck I'll take a stab at it, and I'll WIN (this time!). This wager was before a blizzard hit, the streets were dry and free from snow....well here we are, a blizzard later and then more snow this weekend (yes more!) SO my challenge was quite a bit different than those in sunny 75 winter in southern California - But have no fear, I'm Here!!! Here's my wintery take on light pales & whites to be a classic look that no season need put a limit on. Will you be rocking WHITE DENIM before winter is over????? And tomorrow be sure to see my favorite Chicago blogging Buddy: Anna! Editors note: I only wore this to take these pictures, I would have ruined the heck out of these jeans had I ventured anywhere! Puddles and black slushy mush snow inches deep would have been the death of them!! If the were skinny jeans I would have run all over town, because this change from dark to light was such a welcome change! But you can believe I'll be sporting this for real & real soon! Mother Nature so dry streets please! Yay - fellow blizzarder and winter-white-wearer! You look TRES chic. Love the pops of red with it! Yay! Looks so great. Yes, I hardly wore mine (just outside for a bit) but it was so gross outside! You looked great. I wore my white denim to meet a friend for breakfast and as all the snow was melting, the bottom of the jeans turned black with all the puddles and such. I had to change into something else before heading to my superbowl party. But it was fun! my only whit denim jeans are cropped, so sadly they are restricted to warm weather. Those banana wedges are adorable! Love the color. i love white in winter! you look fab..though blending into the snow :( stay warm! looks goos to me! You wear it well!! Bold red with the white is such a great way to go! I'm dying over that ring - Forever 21 can surprise you sometimes. That oufit is fabulous!! I love every bit of it! This is great!! The red accessories really pop against the light colors. I'm in Chicago too( participating on Wednesday! ), I was worried about how it would come together in all the snow but I was pleasantly surprised, white on white is a good look I think! P.S. Cracked up at your editors note - I totally only wore mine for the pictures too - no way I'd venture through puddles and piles of dirty snow in those babies!! Love it! I think I need some white denim in my life! Oh my gosh look at the stripes and the red with your white!! GAHHHH!! I am loving checking out all these looks!! Totally seeing things I hadn't thought of. Girl I neeeeed some red in my life. You look so CUTE in the scarf and that whomper of a ring. Adorable!! And ps-all ya need is a knee high boot to carry this off in the slush and snow. I think you should get a pair STAT! Thx so much for doing this! I love your white, grey, and red combination. What a cute look! I'm definitely wearing white this winter and doing Carrie's challenge tomorrow! I love that fabulous ring you're wearing! Fabulous outfit! 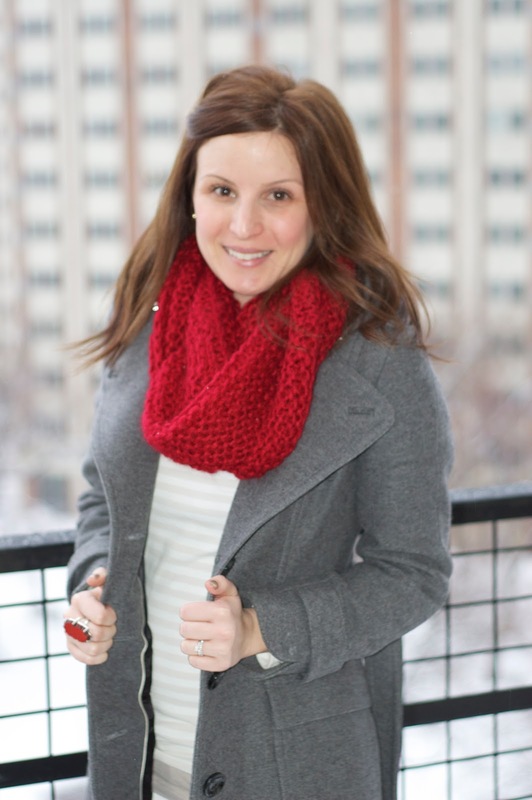 LOVE the pops of red with your ring and scarf! love your blog name and header picture!!! Im inspired to get me some white denim! sweeet! Looking white hott lady!!! Hecks yeah to white denim! Gray and white work together really well! Oooh I want a striped shirt too! You look prefect in the snow and all!!! Oh MY!!! This outfit is as stunning as you! I am so grateful to Carrie for this challenge! Happy to meet you and follow your blog! You really did an amazing job styling the white jeans girl! Aww cute! I like the red scarf with this.